The world is full of sounds. Some are pleasant and wanted. Others are not. Nature is also full of sounds –wind in the trees, waves on the shore and crickets in the grass. Unfortunately, much of our lives are filled with unwanted sounds-horns hocking, roars from engines, squeals of brakes, and beeps from machines. 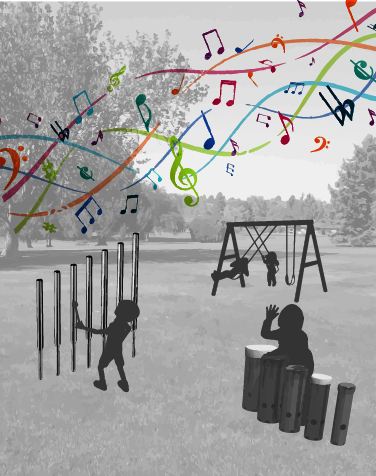 Soundscape design is a practice that connects art with landscape with urban design in creating beautiful and memorable sound experiences for people. A Soundscape approach considers sound as an important element of design. It differentiates between unwanted and wanted sounds in a place. It researches and studies sounds of preference. It manages sound by ‘masking’ unwanted sounds and emphasizing wanted sounds. 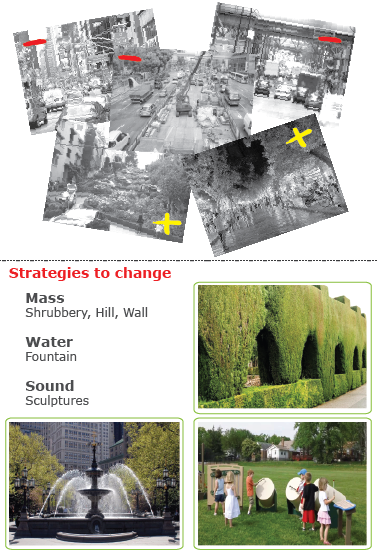 Soundscape design differs from noise control in that it accepts sound as a component of urban life. Soundscape design aspires to manage sound and to create memorable sound places in a city. Just as people attend musical concerts in concert halls, you can create a sonic garden where people go to be intrigued by sound. Sometimes unwanted sound cannot be masked or remediated and so places need to be made that introduce artificial sound to create a soundscape. For this digital transformation, you will need to imagine placing microphones to capture pleasant environmental sounds. You will need amplifiers or speakers and a computer with sound software. You will need to compose a soundtrack. 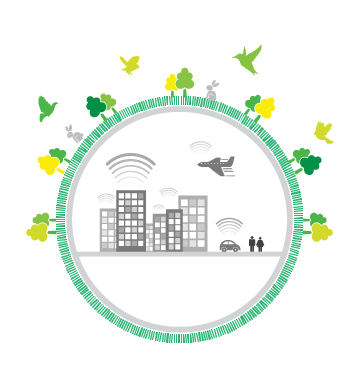 First, select your site as each soundscape is very specifically tied to the characteristics and users of the specific place. It is important to visit the site over time and to prepare a site analysis. This analysis should include weather, sound, human activity, paths, landscape, and destinations. All of these components will help you locate your sound interventions. Take a look at the musical swings and the musical stairs videos to see urban space transformed into sonic spaces. Decide if your soundscape will be musical sounds or sounds of nature or both. Create a musical score for your site. Consider daily living as a cycle between sleep, activities, recreation and socialization. All of these phases can have pleasant sounds and not harmful, disturbing sounds. Chances are you already know loud sound spaces in the city where you live. Imagine a busy intersection. Imagine a construction site. Sometimes soundscapes are places of social interaction and excitement like a plaza full of people, birds, and a large fountain. Find a loud soundscape in your city and make a word sound diagram of it using your sense of hearing. Listen carefully to understand the background noises, intermittent noises, event noises and ‘sparkle noises’. List these sound types and color-coding them. Make the louder sounds in larger font size and the quieter sounds in smaller type. Sometimes soundscapes are quiet like in a park removed from urban noise. While nature is rarely completely silent, managing spaces in a city for respite from painful and unpleasant sounds is important for reducing stress and calming. Acoustic Ecology is an emerging field in which acousticians and sound artists and technicians are recording and mapping sounds of nature. Natural sounds of grasses, creeks, trees and insects, birds and animals existed long before people came. Now that you are sensitive to sounds in space pick one of the spaces that you mapped in activity 2 and consider how to improve the undesirable noises in that space. Your ideas can work both to minimize or mask unwanted sounds and to introduce and emphasize desirable sounds. Take a picture (or pictures of the place) and print them in gray tone. These are your ‘before photos’. Add symbols from your color-coded chart on them to show negative and positive sounds. Label this photo ‘before’. Consider background noise, white or masking sound, sparkle or delight sounds, and event sounds. Now imagine what could be placed to minimize the bad sounds and increase or emphasize pleasant sounds. Perhaps you will add a fountain for the pleasantry of gurgling water as a masking sound. Perhaps you can create a wall of shrubbery to block or absorb unwanted sound. Perhaps you can introduce playful sound sculptures for people to talk into, make music, or play on to introduce overriding sounds. On a second set of photos add the sound mediation strategies. Present your ideas showing the before and after (or proposed) diagrams. 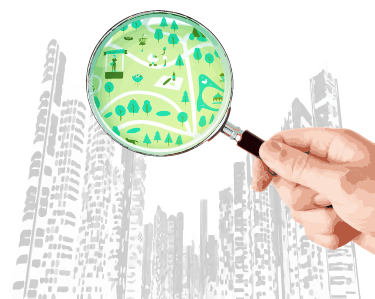 You are working as a soundscape designer and an urban acoustician! Make a sound chart. 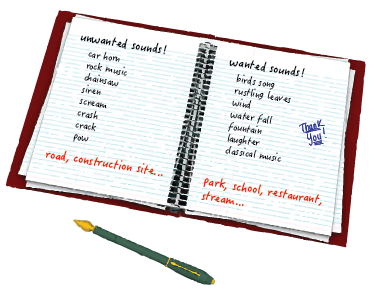 On the top half of the list, write all of the unwanted noises that you hear in your life. On the lower side of the list, itemize all of the sounds that bring you pleasure. Now go back into your chart and think of a place where you can find these pleasant and unpleasant sounds in your city. Google map your pleasant and unpleasant soundscapes and copy your maps and add them to your chart. Share your chart with other people. See if they can add any sounds or places. Video Can Silence Drive You Crazy?